An Artist’s journey through the world of Arts and Crafts. Come and enjoy my projects and stories about making jewelry, knitting, and whatever crazy art/craft project I have going! To sign up, just send me an email, adinasartistry@yahoo.com, or give me a call. Since this has been such a crazy winter and there have been so many cancellations and people having trouble with the snow, I am offering everyone an extra chance to make up all the missed lessons. This is for anyone who has missed all or part of a class this winter term. So, if you can stop by my studio, this Sunday March 14Th, from 12:30-3, you're welcome to bring anything you have unfinished, or something you just need a hand with. I am only asking for a $5 donation for the class. For this class, bring any 28 or 30 gauge wire and your choice of beads, and a crochet hook. 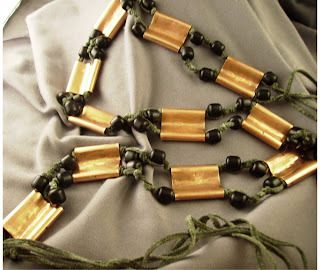 The look and style of work will vary greatly from your bead choices, but anything will will teach you the technique. I personally love pearls, and smaller side drilled beads for these. If you want to get a head start on your project, pre-string your beads onto your wire. For this one, you need a cabochon. 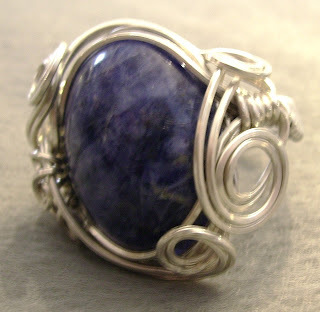 I use a, 18X25 oval, but you can use many sizes and similar shaped stones. Also, 22 Gauge square wire, and 20G half round wire is needed to make this piece. I have some stones, and wire, but you can get a lot of stuff at local shops and online. Woven wire!! Totally an addicting craft. What you'll need for this class, or any try at wire weaving are: a Quick Grip clamp, available at more hardware store, pliers, including a nylon jaw plier, good wire cutters, masking tape, a ruler and time!! The metal we will be using is 6 feet of 22 gauge round, dead soft wire, 18inches of 14 gauge, round dead soft wire, and 2 feet of 16 gauge half round wire for bindings. This will make a woven wire bracelet that is very modern and can be easily worn by both men and women. For the fancy Cuff, pictured above, you will also need 14G, but you will want to buy 24, 26, 24twist 18 & 20. So basically all the wire you can find go into that bugger! Not to mention beads and what not. It's hard to see the weaving in this picture, but it's what holds the entire thing together up the sides. The more you add, and more you do to these pieces, the better and better they get. I don't usually post or recommend books for students to buy unless they ask, but in this case, the book on Woven Wire Jewelry by Linda Chandler and Christine R. Ritchey is so well written, detailed and easy to use, I suggest people buy it prior to class. You can also visit the website http://christineritcheyjewelry.com/ for more. 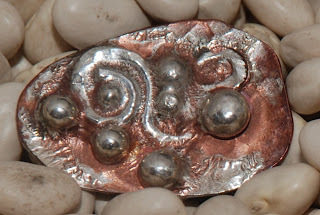 Also, we will be using a little metal clay in this class! It's a great thing to combine with woven wire, and I use Art Clay 650, slow dry with my pieces, but we'll discuss more of that the first class. I hope I see you there, and that you're all staying cool this summer! Wire Charm, or link Bracelets! So, recently someone asked me about my favorite thing to make, and hands down, this is one of them! The links are easy, and you can make them in large batches. Plus, if you make them in groups, you can throw them in a tumbler to polish. To connect them, you can use either jump rings, or beaded links. If you use the jump rings, make sure you get the good ones! 16G, or 18G rings are available from Fire Mountain Gems, and I've found them to be good quality. Also, I like to make a beaded link with 22G wire and pearls. It takes more time, but is a nicer look. To make it into a charm bracelet, you simply loosen the curls in the links and add beaded charms. (Remember to tighten them again later or your bracelet will fall apart!) I like to make beaded links in huge numbers. Often, when I don't know quite what I want to do, I'll make bead dangles and charms with whatever beads I left out on my table since the last time I worked. So, sometimes I call these my "clean-up-the-table" bracelets. To make them, you'll need 14G, and 22G wire. Jump rings or beads as desired. Tools: Extra long round nose pliers, cutters, needle files, hand file, ball peen hammer, and a hammering block. I teach these in almost every term I teach at the Pittsburgh Center for the Arts, or Sweetwater Center for the Art. 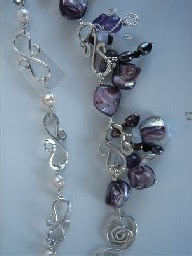 And I have a class coming up at Moonrise Bead Company in Monroeville Pa March 20th on this very project. Knitting With Beads!! All the basics you need! Welcome to the wonderful world of knitting with beads. Here are some guidelines to help along with your projects in this fun craft. *You can use just about any type of fiber for knitting with beads, wool, cotton, silk, or a combination. What you need to pay attention to, is the thickness of the yarns you choose. Lace weight and sock yarns are some of the best choices, as is cotton crochet thread. If your yarn is too thick, beads will not be able to fit into your yarn. *The best beads for knitting are seed beads. They are small glass beads and come in a variety of sizes and shapes. They are numbered 6/0, 8/0, 10/0 and so on, with the larger beads having the smaller numbers. 6/0 beads are the best choice for knitting as they have the largest holes. Before knitting, go through your seed beads and sort them, removing any irregular or odd beads. *Seed beads also come in a variety of finishes. The easiest to use in your knitting projects are the shiny, gloss finish beads. These slide nicely up and down your yarn and will snag less as you knit. Silver lined seed beads add a nice reflective quality to the bead and stand out in your knitting. Matt finish beads, often labeled "opaque" are harder to see when knitted into a fabric and don’t move as easily up and down your knitting. *Color is also a consideration when choosing beads. Contrast tends to be the key, as same or similar colors often fade and don’t show in the knitted fabric. This can be compensated, however, by choosing beads in complimentary colors beads with special finishes. "Rainbow" beads are predominantly one color, but have variation that provides visual interest. AB finishes (aurora borealis) have a luminescent quality that produces lovely effects in knitting. Also, matte or opaque beads slide less, making it more tedious to incorporate into your knitting, but often are worth the effort for the look! There are several methods of getting your beads onto your yarn. The best is called pre-stringing. As the name implies, you thread all the beads you will need for your knitting project onto your yarn prior to casting on. To do this, take a "Big Eye Needle" designed for beading and thread your yarn through it. Pour your beads into a small bowl and thread them from your needle onto your yarn. It can take a while depending on how many beads you need for your work. Another method is using a "stringer" to add beads directly to a stitch as you knit. I prefer to use a crochet hook, rather than a dental threader, but the technique is almost the same. Work to the stitch where the bead is required. Slide the bead onto the shank of a very small crochet hook. Take the stitch off of the left-hand needle, onto the hook. Slide the bead over onto the stitch. Replace the stitch on the needle and work it, or slip the stitch as the pattern demands. To use the dental threader, you must first open it up, separating it from a loop, into a "U". Slide the stitch onto the threader so that it sits on the bottom of the "U". Slide the bead over both ends of the threader and onto the stitch. Return the stitch to the needle. Here is my pattern for a beaded scarf. 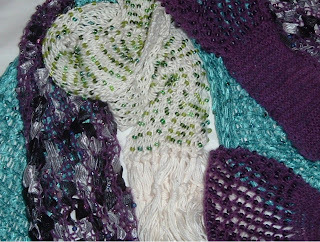 It's a fun and easy project, a great start for people wanting to start knitting with beads. I love combing my passion for beads with my addiction to knitting. Though, I do find that my hands tend to cramp up while knitting with beads for long periods of time so try to take frequent breaks while working. Have fun and as always, feel free to post any questions or shoot me off an email! Pattern note: PB = Place Bead. With beads threaded on working yarn, bring the bead up to sit next to the last worked stitch. Lace yarn tends to tangle easily. To avoid tangles around your beads, place the working yarn and the beads into a small box or container to keep things neat. Materials: 400 yards of lace weight yarn, approx. 1,000 size 6/0 seed beads. Size 5 needles and big eye beading needle or dental threader. Gauge is not crucial to this project. Row 1) K3, "PB, YO, K2tog” to last two stitches, K1. Row 2) K2, “YO, K2tog” to last two stitches, K2. Row 1) K3 "PB, YO, K2tog” to last two stitches, K1. Row 3) K2, "PB, YO, K2tog” to last stitch, K2. Row 4) Knit all stitches. Row 2) Knit all stitches. With beading needle or threader, thread beads onto yarn. With #5 needles, Cast On 22 stitches loosely. Using any of the above knitting patterns, work scarf to desired length, or until out of beads. Bind Off loosely using a larger needle. Everyone has been asking for me to make up a list like this. Sorry it took so long, but here it is. 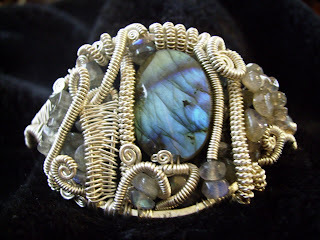 There things are a great starting place for anyone interested in wire-working will need to make jewelry. Most of the items are available through any Jewelry Supplier such as Rio Grande, Thunderbird, http://www.thunderbirdsupply.com/, or Indian Jewelry Suppliers, http://www.ijsinc.com/. Fire Mountain Gems, http://www.firemountaingems.com/, carries a large number of good quality pliers, but not all the specialty pliers you may need down the line. The most important thing to remember is to get the best you can afford. That doesn’t mean you need to spend a ton of money, but in this craft, quality matters and the least expensive tool, is usually the worst. Pliers: Round nose, extra long round nose (yes you really need both), two pairs of chain nose pliers, bent nose pliers (I totally love these) and forming pliers. The best kind of these, are ones that have a curved side, and a flat. Don’t get the convex/concave pliers. They’re no good for what we’ll be doing. Cutter: It’s important to have a good pair of Flush cutters. Be aware of what sizes of wire can safely be used for each pair you may purchase. If something says the maximum wire gauge is 14. Don’t try to cut something thicker! It might succeed a few times, but you’ll wear out your cutters very fast and run into more safety issues. Hammers: A good chasing hammer is a must! A ball peen hammer, available at most home improvement stores will be good, too. The problem is that it needs to be polished and dressed to be able to use without scratching your metal. For this you need access to polishers and other equipment most people don’t have, which is why I say to go with the chasing hammer, since it needs no alteration. Mallets: A good, lead-loaded rawhide mallet is best. If you can’t get one of these, a nylon mallet is a good substitute for a lot less money. Bench Block: This is a square piece of steel for hammering. You can only work on a piece of jewelry as large as the bench block you have, so buy the largest size you can afford. Mandrels: These are steel forms for making jewelry. If you plan on making rings, you need a ring mandrel. Same thing goes for bracelets. They cost anywhere from $15-$150 dollars depending on size and weight. Just make sure you get steel, not metal or plastic, and that the mandrels taper from size to size. There are some that "step" from one to another, but these aren’t very good and will cause you more trouble than they’re worth. Files: A set of needle files and a couple of hand files can be purchased from the home improvement store. But you’ll actually pay less through a jewelry mail-order place, and get a better piece. Remember if anyone wants help going through catalogs, picking out what to order, just give me a call or an email. I hope this helps get you started on what you need to set up your own wire-jewelry workshop! OK, it might be safe to say that I'm getting obessed!! The top piece is a belt made out of coupling (That's essentially pieces of pipe that are already cut to a specific size). Every time I wear it people ask me where I got it! They just laugh when I tell them it was made from piping. The second one I half metled on purpose to attempt some unusual effects. Cool, hu? I think I'm going to make it a pin, but haven't decided just yet! Other options are still floating around my head with this one. Last year, when the rising cost of silver nearly put me out of the jewelry business, I began exploring alternative materials. I have enjoyed the wonderful creativity that working in found objects can only provide! I discovered the endless possibilities of working with copper pipe, roof flashing and other builder’s materials. Many of these are purchased new, while I try to make at least half of my pieces using scrap or discarded construction materials. The rings above are made from pipes, while the pin started from electrical grounding wire! Who knew plumbing could be so much fun! Felting Knits! It's just too much fun! In preparation for a weekend felting workshop, I wrote some instructions. Felting is such a fun thing, that I think any knitter should give it a try. And even if you don't knit, there are a ton of projects you can do by felting old thrift store sweaters. Here is my favorite felted Hat Pattern in three versions. So not matter how you like to knit, you'll find one that works for you! Materials: A) 200 yards each of Bulky weight wool, and B) fine weight mohair. Size #13, double pointed needles, and a 24inch circular #13 needle. (or you can use straight needles for the knitted flat version.) Numbers in parenthesis is for larger size hat. With dpn and a strand of each A&B, cast on 12sts, four on each of three needles. Join into a circle, being careful not to twist stitches. Rnd 1, and all odd rounds, Knit. Repeat rounds 1 and 2, adding an additional stitch between increases. On each needle, you will be increasing in the middle, and on the end of each dpn. Continue until there are 9(10) stitches between each Kf&b. – 66(72) sts. Switch to circular needle whenever there become too many stitches to knit comfortably with dpn’s. Knit for 4 ½ (5) inches. Bind off Loosely, preferably using a larger size knitting needle. 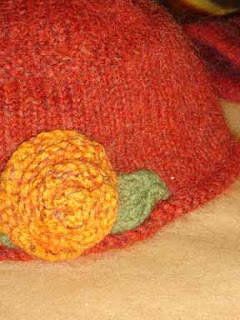 Weave in ends, and using the Cast on thread, sew up the hole in the top of hat. Cast on 96 stitches onto Circular needle. Join sts, being careful not to twist. Work even to 5inches from cast on edge. Rnd 1: Knit one round (repeat on all odd rows of crown). Continue in this manner until you have *K1, K2tog. * (12 sts) Knit one more round. Break yarn, leaving a 12 inch tail. Thread yarn on a tapestry needle, and bring through remaining stitches. Tighten and weave in ends. Begin stockinette st, knitting right side rows, and purling wrong side rows. Continue in St st. until 5inches from CO.
Knit one row, purl three rows. R2: and all even rows, Purl. R5: K1 *K8, K2tog,* K1. Purl one row. Break yarn, and thread on tapestry needle. Bring through remaining sts, and tighten. From the bottom up, seam the hat being careful not to pucker. Weave in ends. To felt hat, place it into a garment bag, or pillowcase tied with a rubber band. Put into washer set to hot wash/cold rinse and lowest water level(smallest load size.) Add items such as tennis balls to increase agitation and just a drop of detergent. Wash, checking frequently on the progress of the hat. (Sorry, you have to try it on wet to see if has shrunk enough to fit!) With some washers, you will want to stop the washing process and check several times within one cycle, others will take several cycles to complete felting. It is not an exact science, and all yarns and washers are a little different. But I promise, once you’ve done it a couple of times, you will learn the quarks of your machine! Block hat. Pull and shape it to fit your head while still damp, and I like to uncurl edges of brim if they shrivel up. Smooth out hat with your hands, and stuff with tissue paper to dry. Hi, I’m a jewelry artist and aside from being completely addicted to making metal and wire creations, I just love all arts and crafts! I’m an avid knitter and painter and my favorite thing in the world is to teach others to enjoy the arts and crafts that I adore!